With so many options available, how do you choose the best gliders for your nursery? I recommend choosing the best glider that is Greenguard Gold certified to not produce any harmful chemical emissions. As you’re setting up your baby’s own gentle nursery, you might be wondering whether you should buy a glider or rocking chair. 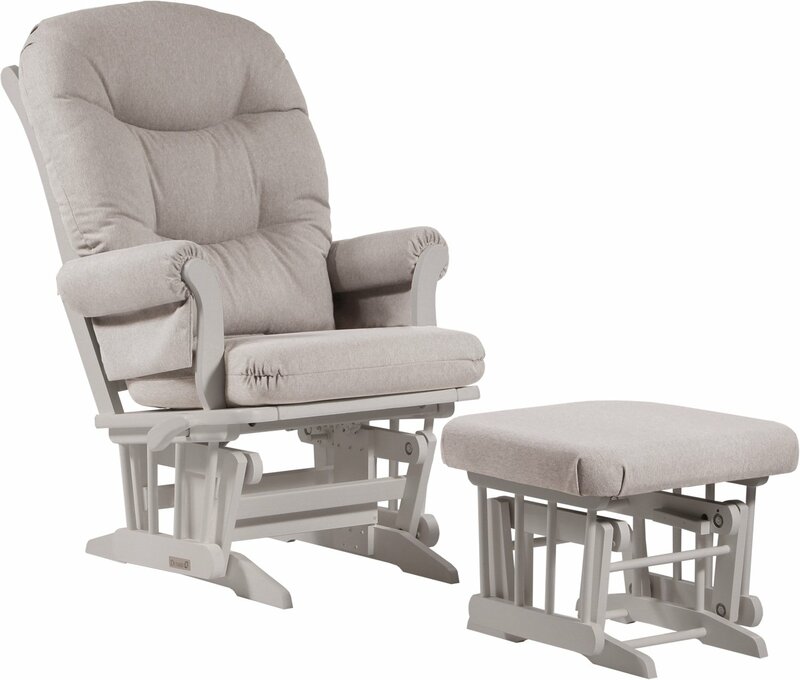 Some families don’t get much use out of a rocking chair, while others use a glider multiple times a day. To me, having a glider is essential and I have probably used mine multiple times each day with both kids, since the day my first baby came home. It’s nice to have a place to cuddle with your little one and to get comfy during feedings. (It’s also where I love to sit and read with my kids, as young as a few weeks old.) Also, keep in mind that the gliding or rocking motion is soothing to babies. 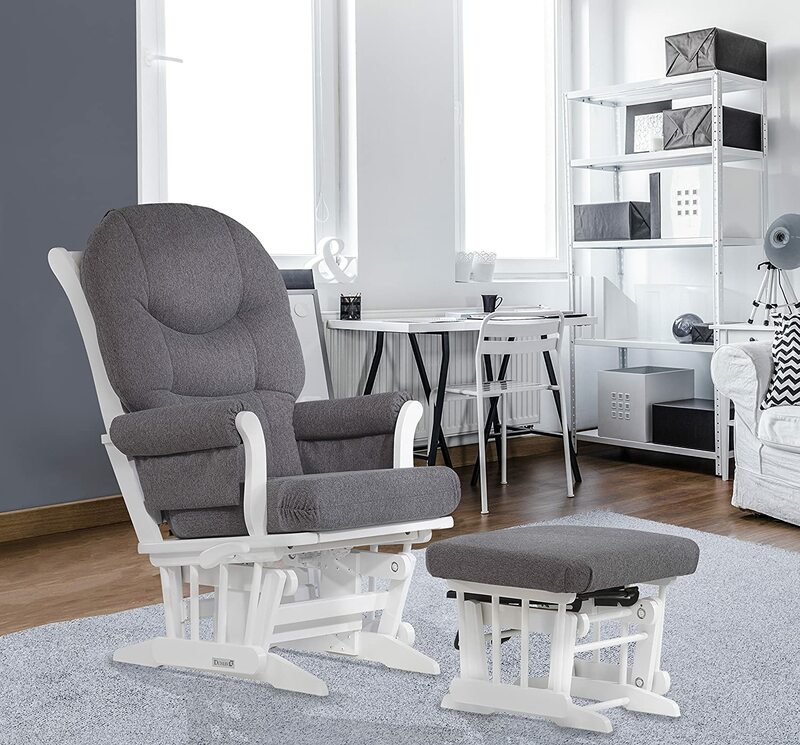 If you’re going to purchase a glider for the nursery, I recommend investing in a non-toxic glider to avoid having a chair that off-gasses toxic chemicals the air in the nursery (and in your home). Below I’ve listed some recommendations for non-toxic gliders and rocking chairs that are Greenguard certified and made with better materials. Please note that these manufacturers frequently change their inventory, so if one model is no longer available, you might find an updated version or a different model for sale. What Should You Look for in a Non-Toxic Glider? Should You Buy a Used Nursery Glider? Preferably, the glider would be made with fabrics that are GOTS or Oeko-Tex certified, but again most are made with polyester that is not certified. If you do end up buying a polyester glider, you could place a cotton blanket or quilt over the seat. Another thing to consider is whether you’d want a recliner. 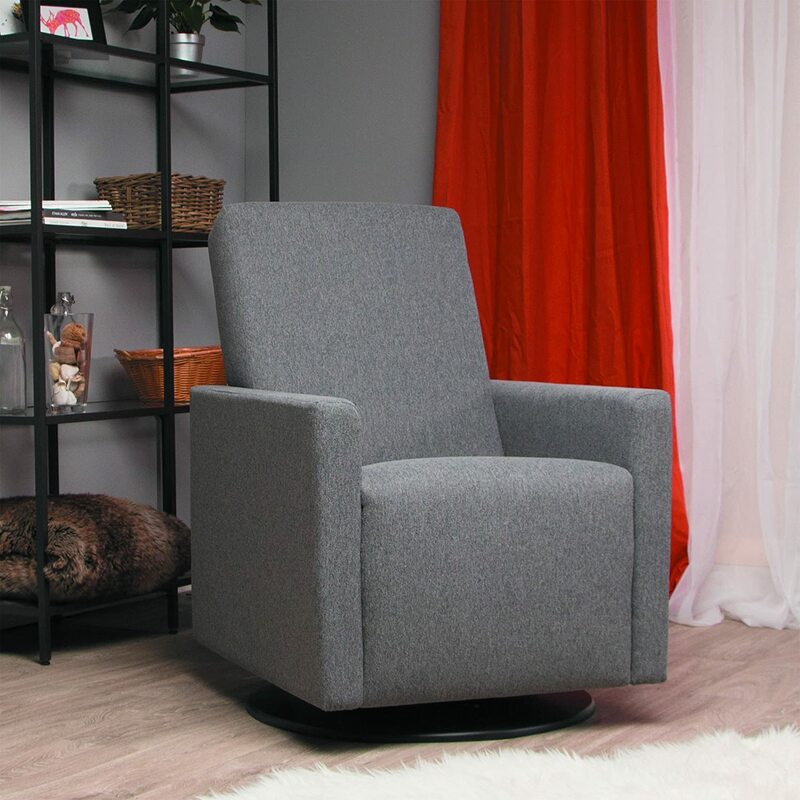 Personally, I didn’t like the idea of using a recliner in the nursery, because I worried it would be too convenient to recline the chair and I’d end up falling asleep there with the baby in my arms. And that wouldn’t be a safe space for a newborn to sleep in. 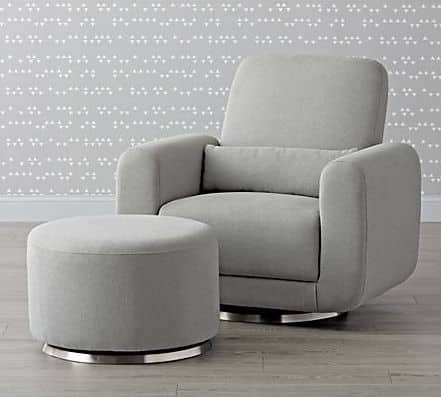 So instead of buying a recliner, I opted for a glider with an ottoman. Price should also be a factor. For example, there is an amazing latex glider that contains no polyurethane foam, but it costs $1,800. That was out of budget for me! Still, I can’t emphasize enough how non-toxic gliders or rocking chairs are worth the investment given that you’ll spend hours sitting on one with your little one. One way to reduce your exposure to off-gassing is to shop secondhand. I considered being a secondhand glider when I was pregnant with my first baby, but I’m so glad I bought a new one. Here’s why: my kids spit up a lot. And I spent a ton of time nursing them on our glider. So, as you can imagine, there was a lot of spit up on it. And their diapers leaked, so there were other fluids on there too. Of course, the cushion covers can be washed, but they spit up all over the place (on the arm rest, on the seatback, down the sides, etc.). Because of this, I can’t imagine using a secondhand glider. I know that not everyone will agree with me on this, but I personally can’t recommend that you buy a used glider. A Canadian company, Dutailier manufactures a variety of non-toxic wood gliders. 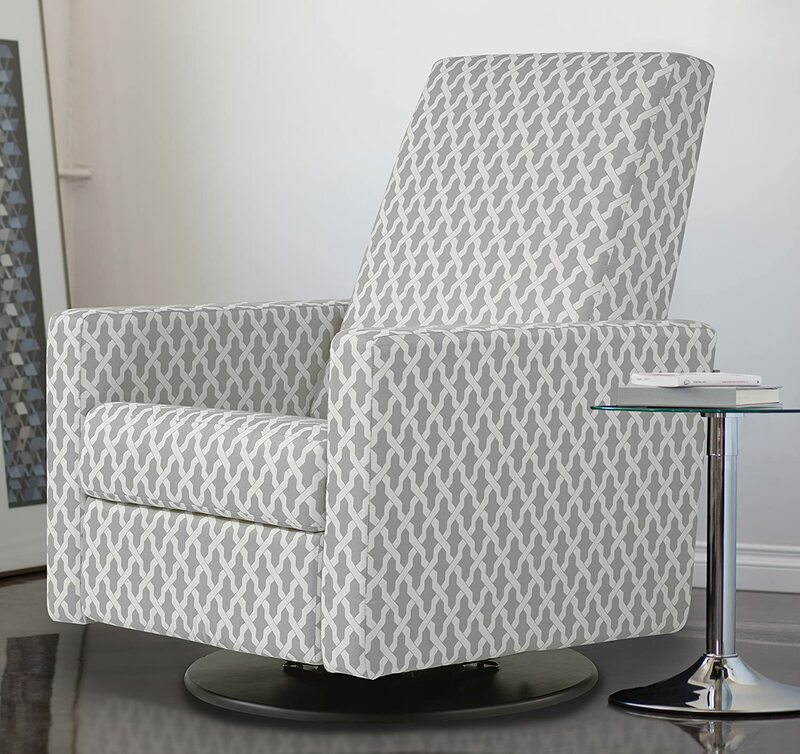 Their chairs are of excellent quality and feature a beautiful, modern design. They have a ton of different styles, colors, options, and price ranges. Please note that their higher-end, higher priced gliders are non-toxic and free of flame retardants (and are CertiPUR-US certified), while their sleigh gliders and more of their lower-priced options are made with polyester. However, their glider frames are made with hardwood and the finish is non-toxic. I also love that they offer a special nursing ottoman just for breastfeeding mamas. Also based in Canada, Monte Design Group was formed by a husband and wife team wanting to furnish their own son’s nursery. The company uses high-density foam that is free of chemical flame retardants (and CertiPUR-US certified), wood that is LEED certified and contains no formaldehyde, water-based paints and finishes that are lead-free, and glues that are water-based and biodegradable. Their fabrics are Oeko-Tex Standard 100 compliant (meaning no hazardous chemicals are used in the manufacturing process), even when polyester is used. The company sells most of their gliders through children’s stores, but you will find some options available for purchase on Amazon and some on Crate & Kids. Pottery Barn has slowly been introducing more and more Greenguard Gold-certified furniture, and I love them for it! They now also sell nursery gliders that are Greenguard Gold certified and feature a solid wood frame. And being Pottery Barn, you know that these pieces are beautiful and well-designed. Some of their gliders are ready to ship within a couple of weeks, while some fabrics require a special order and may take as long as 8-10 weeks for delivery. Plan accordingly. 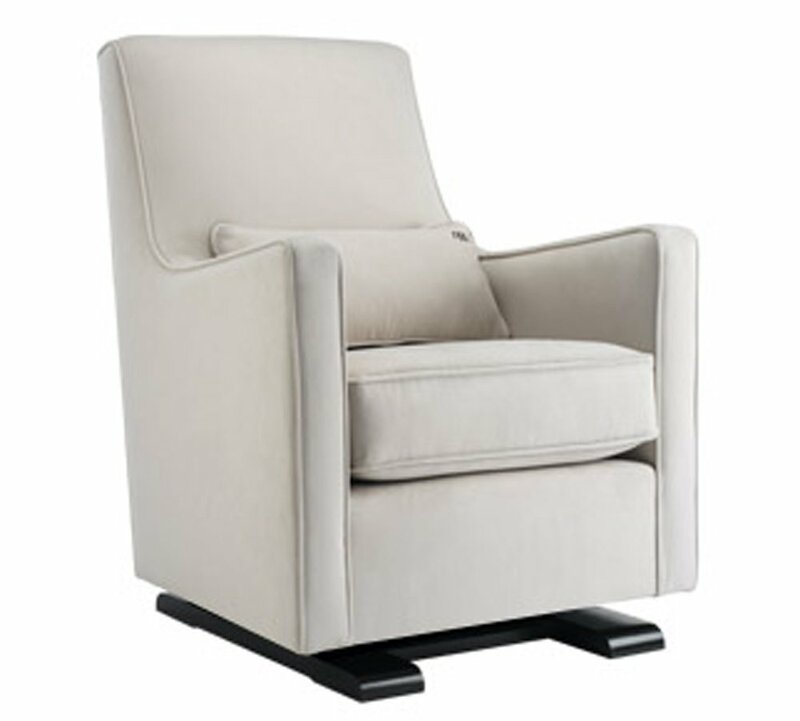 Offered through Crate and Kids, the Babyletto Tuba Slider Swivel Glider is an extra wide glider chair. And most exciting of all, it is made without any chemical flame retardants. It also does not contain formaldehyde, and Crate and Barrel routinely tests their products for lead. 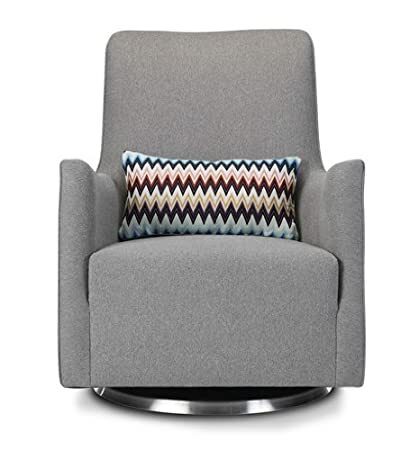 The material on this chair is 100% polyester; just remember to drape a blanket over the chair if you are trying to stay away from synthetic fabrics. 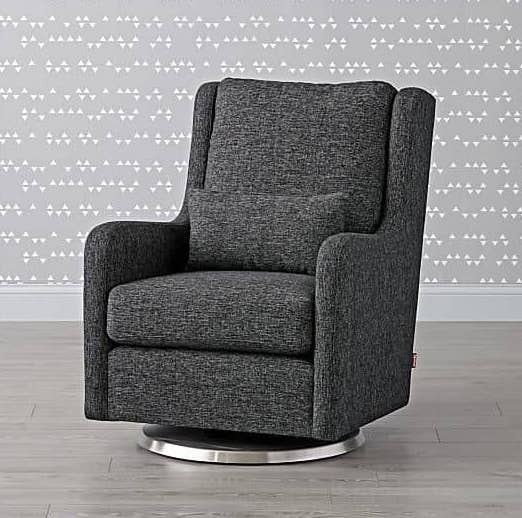 At just over $400, this is a fantastic chair for a great price. 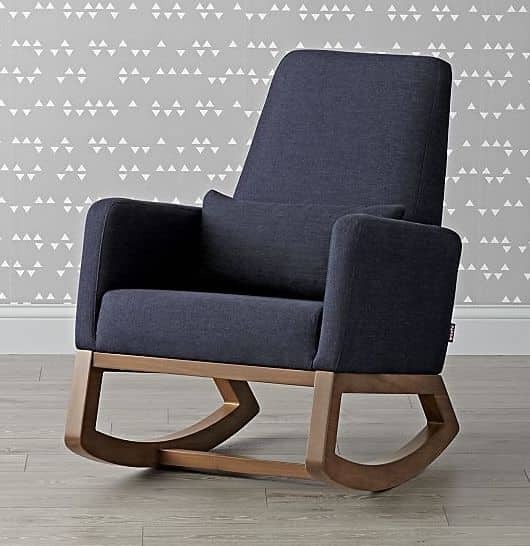 A Crate and Kids exclusive, the Joya Rocking Chair is manufactured by Monte Design Group (see above). This guarantees you a top quality non-toxic rocking chair made with the highest quality materials, including flame retardant free-foam, water-based glue, and lead-free finishes. 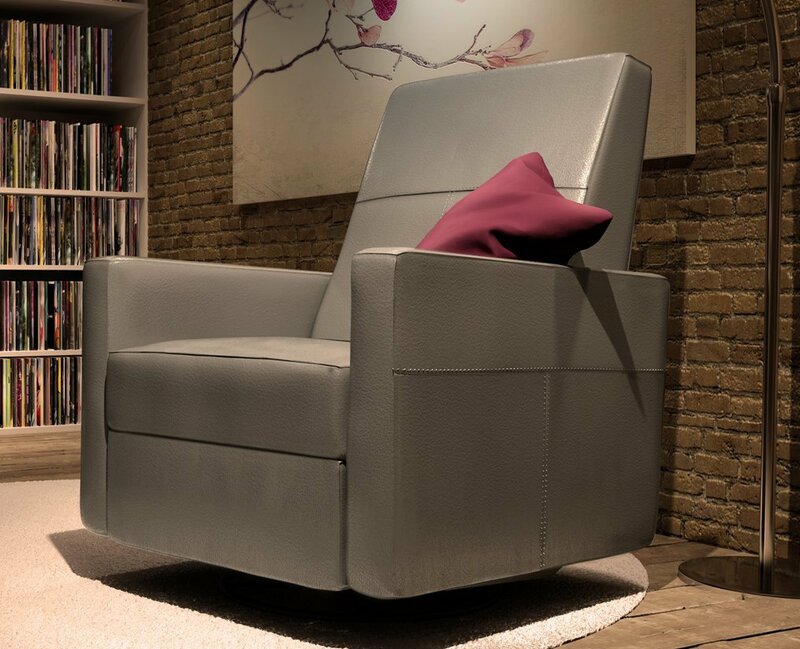 The Joya is a slightly smaller rocking chair, designed to feel cozy. 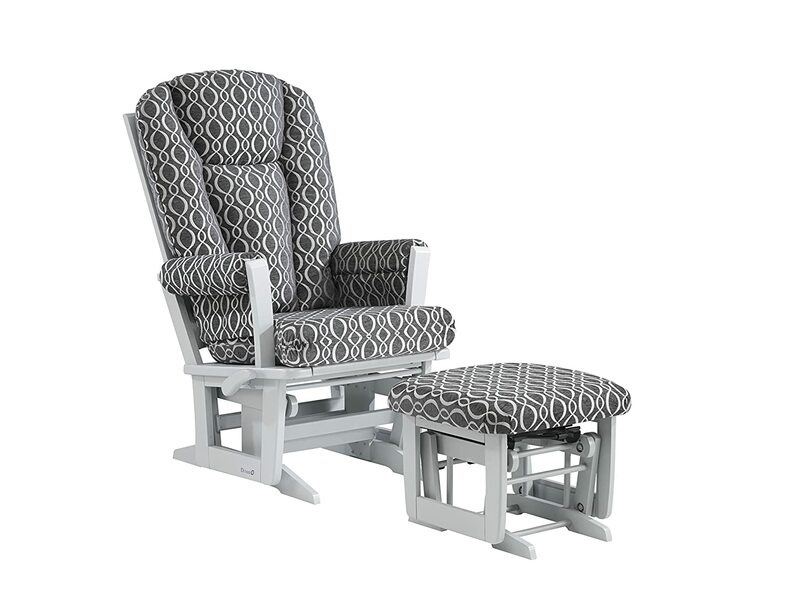 Did you find the perfect glider for your nursery? It’s one of those items I use every day with my kids. I hope you found the perfect one for your nursery! While you’re working on creating your gentle nursery, be sure to check out my guide to non-toxic bassinets and non-toxic nursery furniture too. Hi!! Thank you for your guide. Do you know anything about Karla Dubois? They make a Greenguard Gold certified crib, but wasn’t sure about their reclining chairs. 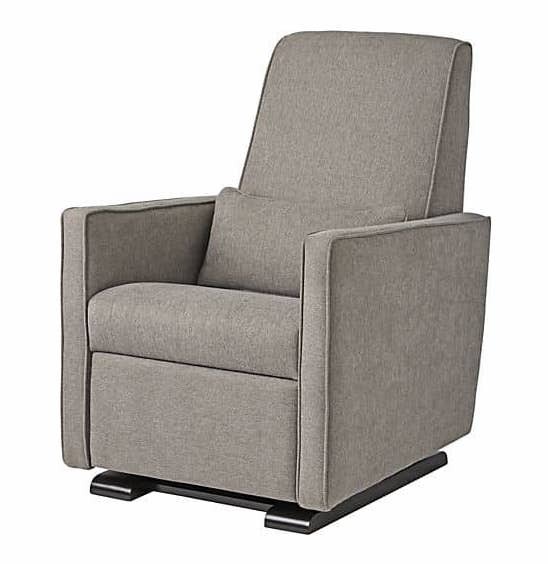 I’m looking for a arm chair/ recliner for my 2 year old . Toxic free. I got him a keets organic chair , but it smells strong. … I’m looking to replace asap. Sorry to hear that. What about a children’s wooden rocking chair? Hi Sean, what a nice chair! I don’t know about the materials and they didn’t disclose any info on their site. I’ve sent them an email and will report back what I find. They’ve said there are no flame retardants but I have replied asking for more info, and on whether the chairs contain formaldehyde. Please stay tuned! Hey there! Curious as to what was the conclusion on these? They didn’t respond further. What’s your budget for a glider?